What’s not to love about the public transport network in London? It’s easy to navigate, runs frequently and is (relatively) fast. Yet we, expats and locals alike, absolutely love complaining about it and it makes a fantastic conversation filler. On paper it’s hard to fault, and with buses, the Tube, the Overground, trams, ferries and trains going everywhere and anywhere just about 24 hours a day, it becomes difficult to justify leaving your Oyster at home. While certainly an improvement on what’s on offer back in Oz, we’ve all experienced those cringe-worthy moments getting groped left, right and centre as you “file” onto the train, or flying down the stairs of a bus as soon as it hits the brakes. If your daily commute involves you constantly being sandwiched up against the walls of a suffocatingly full carriage, you may perhaps begin to think that an alternative way of getting around town wouldn’t be so unwelcome. Many places in central London are in short walking distance of one another. It’s hard to get your head around what’s where if you’re only ever navigating the underground network, but once out in the open air it doesn’t take long to start connecting the dots. You can quickly learn there’s no need to take the tube from Covent Garden to Trafalgar Square, or a bus from Soho to Holborn. It’s much faster (and more pleasant) to go on foot. Short cuts aren’t the only advantage to staying above ground. London is full of charming cafes, nifty bars and musky pubs just waiting to be discovered. There’s a new art gallery or pop-up shop, a vintage boutique or tea house around every corner. 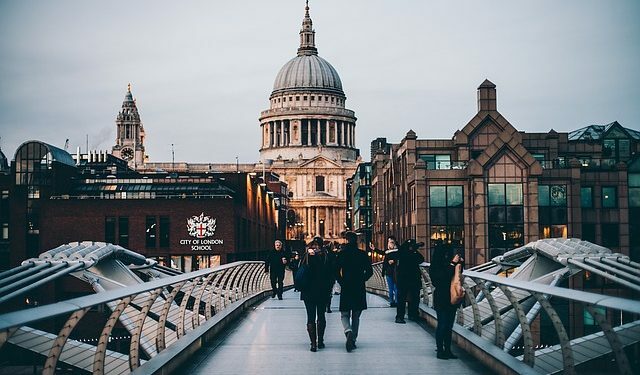 Walking is a basic but often neglected way to better get to know this intriguing city, and if that’s not enough to convince you to dust off your runners, it’s also good for burning off winter’s one too many sweet treats. Of course if you’re too fast paced for a leisurely stroll around town, riding is another fast, cheap and green alternative to public transport. There are thousands of cyclists in London, whether it’s a passion, occasional pleasure or just a way to save a buck, it’s a very popular means of getting around especially with students and young people. Many cyclists (the non-appassionatos that is) prefer to purchase second hand bikes to reduce the risk of coming back to a partly dismantled one. If the bike has a basket, it’s always wise take it with you, likewise the seat. There’s not much need to mention that chains and locks are essential. There are also bike-sharing schemes which can be signed up to use if the responsibility of owning your own is too daunting. Just be sure to return them on time to avoid finding yourself with a hefty bill for a replacement bike. But before you cut your Oyster to shreds and rush off to buy a new set of wheels, a word of advice: if you’re not used to riding in traffic, London isn’t the place to learn. With the very fast moving traffic and many buses it may be worthwhile sticking to one of London’s many parks until you find your bike legs.